The data-storage requirements of the modern-day consumer are such that, in most cases, a simple USB-attached hard drive will no longer suffice. Be it the music on your tablet, the photos on your smartphone, the movies on your PC or the work on your office system, there's a growing need to be able to centralise all this data, secure it, and make it available across various devices and platforms. One of the best methods to achieve these results is with a Network Attached Storage server, more commonly referred to as a NAS. A NAS is a computer system comprised of one or more storage disks, network connectivity (typically in the form of Ethernet), and an operating system. Designed to attach to a home or office network, the NAS primarily offers data-storage capability to a wide array of devices, giving users the ability to centralise their data in one convenient location. 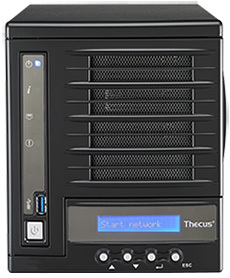 The acronym and indeed the frequent use of the word network may make it seem as though NAS solutions are geared toward professional use, but today's models are increasingly user-friendly to the extent that consumers with little-to-no computing experience should be able to setup and install a home NAS with minimal fuss. There's plenty more these units can do - keep reading to discover more - but in a nutshell, a NAS can be thought of as an external hard drive that, instead of being hooked up to a single PC, is connected to your network and made accessible to all the computers in your home. Consumers with multiple devices ranging from PCs and laptops to tablets and smartphones should be receptive to the convenience of centralised storage. Ever gone into the office only to have left your documents and spreadsheets at home? Ever wanted to listen to your PC's music library on your laptop? Or have you ever wanted to your view your photos away from home on a tablet? These are all in scenarios in which centralised NAS storage could help. By keeping all of your data in one networked location, a NAS can serve data to multiple devices from a single source, making it easy to maintain continuity between computers and to share files with friends, family or colleagues. Given the proliferation of mobile devices, having data available to computers on the local network is only one piece of the puzzle. Recognising that the contents of NAS servers need to be accessible while on the go from smartphones and tablets, leading vendors have made available companion apps that allow comprehensive cloud management. 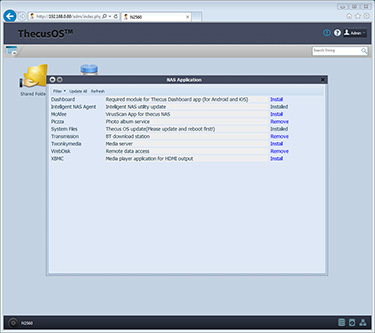 As an example, the Thecus T-OnTheGo smartphone app (pictured left), is available for both iOS and Android devices and permits users to manage/view files while on the move. Being able to read documents and play videos while away from the home/office is a an obvious boon, and manufacturers are already finding ways in which to make cloud access more advantageous. 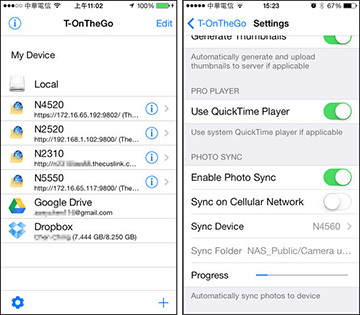 With T-OnTheGo, Thecus offers users the ability to take photos on their smartphone and have them synchronised automatically to the NAS; allowing the user to free-up valuable space on their mobile device. Our data has become integral to our everyday lives, and the thought of losing critical office documents, treasured photos or a music library that has taken years to put together doesn't bear thinking about. While a NAS isn't bulletproof, it can certainly offer peace of mind through various built-in backup utilities. The available options will vary from one NAS to the next, but a device with two or more drive bays will typically offer support for RAID mirroring, where the contents of one drive are replicated on the other to help provide security against drive failure. 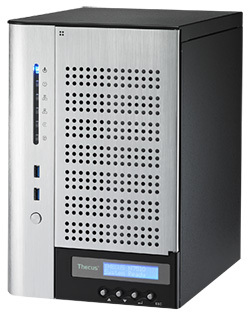 In addition to RAID, today's NAS solutions are able to offer a choice of backup methods that range from local synchronisation to an attached USB drive, remote replication to a networked destination, support for Apple Time Machine, as well as the ability to backup data to cloud storage services. The fiercely-competitive NAS market has resulted in a huge array of devices to choose from. 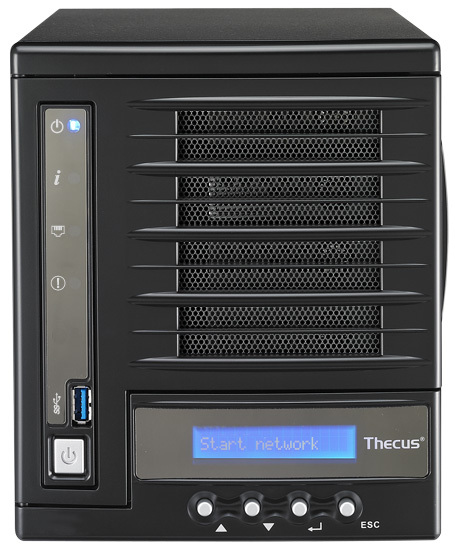 NAS solutions can range from small USB-attached, network-capable drives to full-sized towers that ship with or without installed drives. The latter typically demand a higher premium but offer greater performance and higher capacity. The most obvious differentiation comes in the form of drive bays, which in turn dictates maximum supported capacity and available RAID modes. 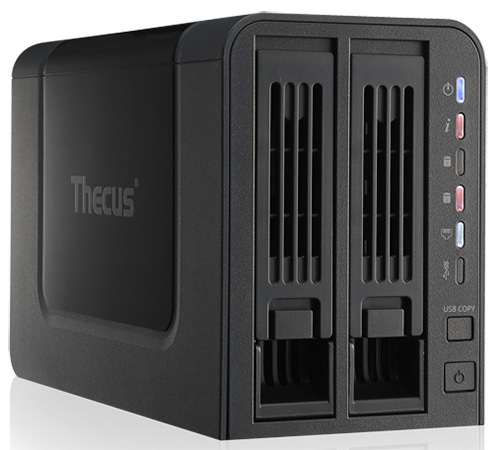 Small dual-bay models such as the Thecus N2310 are aimed primarily at home users and offer support for RAID 0 or 1 (striped for performance or mirrored for security) and a maximum capacity of up to 8TB when equipped with dual 4TB hard disks. More advanced models, including the four-bay Thecus N4520 and seven-bay Thecus N7510, introduce support for complex RAID modes such as RAID 5, which requires at least three disks to operate, as well as far greater capacities, with the N7510 offering a maximum storage capacity of up to 28TB. 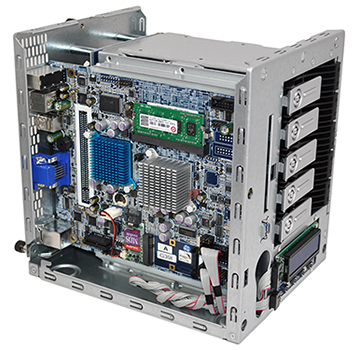 Like a typical PC, NAS units are equipped with a processor and memory, and these components contribute to overall performance. A NAS with faster underlying components will be better equipped at dealing with network data transfers at speed, though of course the extra performance will be reflected in a higher price tag. Today's NAS solutions are available in a wide choice of flavours aimed at specific audiences, and a mix of component configurations are used to help tailor the hardware. Most NAS units aimed at home or small-office environments are often outfitted with an inexpensive, low-power processor based on the ARM architecture. As is the case with PCs, premium NAS units at the opposite end of the spectrum tout higher performance through the use of latest-generation Intel processors and greater quantities of onboard memory. Our own benchmarks have shown that the performance gap can be significant, with premium Intel-based units offering in some cases practically double the theoretical bandwidth of more affordable solutions equipped with ARM-based processors. But all this talk of processors and memory begs an obvious question: if a NAS is effectively an energy-efficient PC connected to a network, why not make your own? It's certainly an option, however the obvious advantage to tailor-made NAS units is that they ship with customised Linux-based operating systems that are specifically geared toward network-storage requirements. 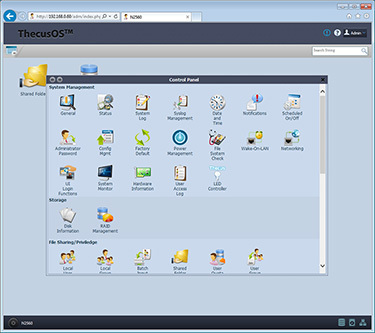 As an example, all current-generation Thecus NAS solutions ship with Thecus OS 6 - an onboard operating system that promises simple configuration, accessible management utilities and a wealth of functionality that typically isn't available to home-made builds. The range of features on offer encompasses print-server support, dedicated download clients, built-in FTP servers, user accounts with configurable privileges, DLNA-compatible media servers and much more. 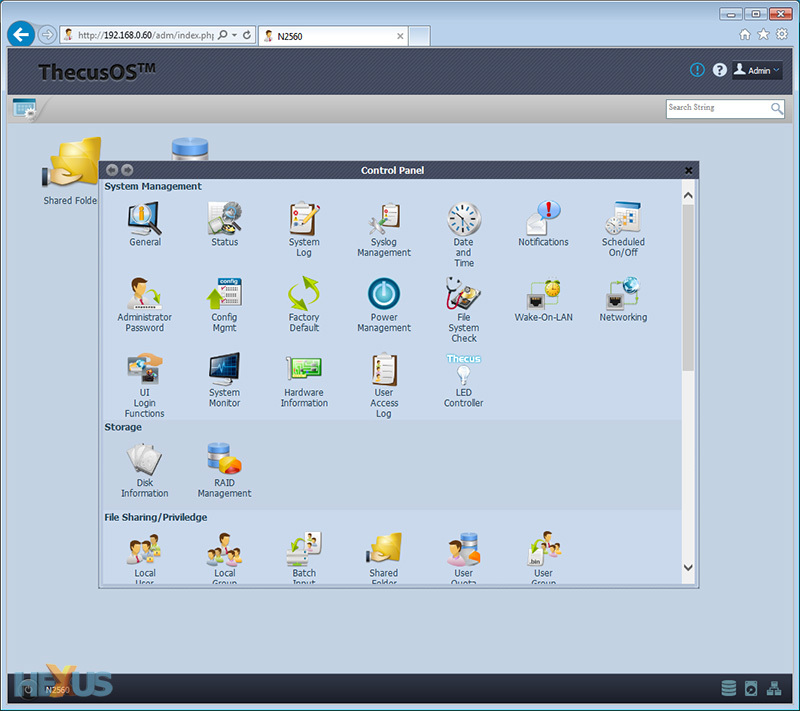 To get a true feel for everything that's on offer, consumers can access a free online demo of Thecus OS 6 to get a hands-on feel of the UI and feature set. I decided to go self-built because I wanted to use the added versatility of having a full-blown OS alongside my data. I can run whatever DLNA, backup, etc software I like, and anything I want to offload from my desktop. I have used NAS units in the past though, and for the ease of setup, compactness and value I can very much see the attraction - they just don't quite fit my usage scenario right now. I, like many, went with the HP microserver. After the cashback deals these things come out significantly cheaper than any other 4bay NAS solution. Softwarewise, personally i think Free-NAS 8 is hard to beat. 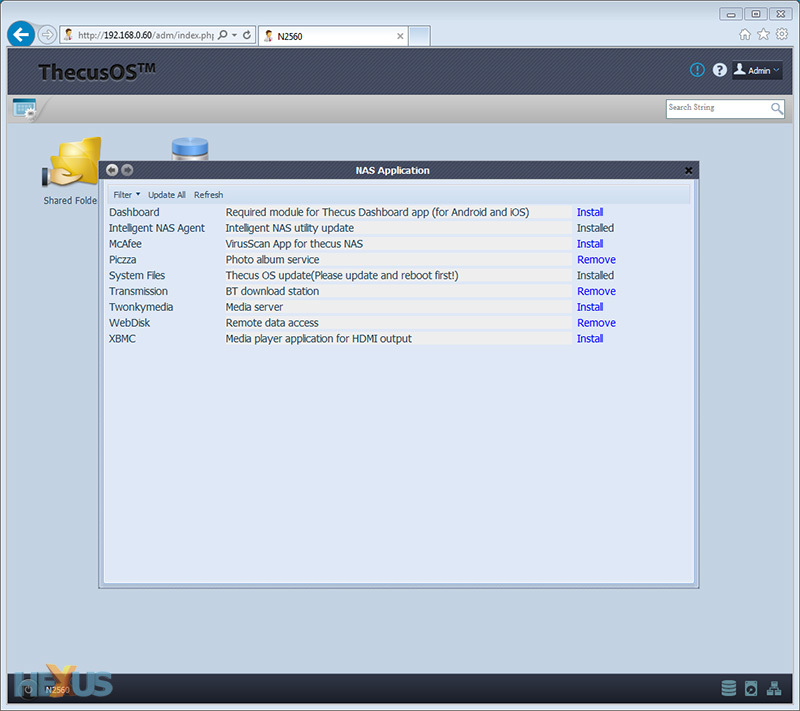 Whilst not perhaps quite as easy as a Thecus or a QNAP, its a Free-BSD based system that's matured to the point that (with the assistance of the manuals and guides) its pretty easy to get configured. Edit - seems its on freenas 9 now, might need to look at updating that. I think 2 bay and 4 bay units from QNAP, Thecus and Synology are really the way to go. Not only do you get convenience and reliability, you get performance and apps supplied for smartphone tablet management of these devices as well. Besides, it is hard to beat the power-saving nature of these NAS units compared to self-built models. One suddenly realise that backups are far more important now that you are storing plenty of data in one place, so having additional disks to make a couple of archives would be vitally important. As FreeNAS 9 uses ZFS by default the system requirements are a chunk higher, so bear that in mind if migrating (though it can still support UFS).